2018 was a fantastic year for Niall Culleton. After a brilliant year in darts, Niall became the Number 1 player in Ireland. Darts has grown exponentially in Ireland and is now a highly contested sport in the country. It takes dedication and years of practice, and Niall is a very dedicated player and the long hours he puts in on the practice board pay off. I caught up with Niall Culleton recently to discuss his experiences and what the future holds for him. When/ at what age did you first encounter darts? When I was about 12, I used to go down to the pub with my uncle and my father and just play the odd game. I used to have a board in my room at home but never did anything else with darts. Rugby took over with me and I made the Leinster under 18 team. I didn’t have much time for anything else but three years ago when my uncle was in ICU in the Mater Hospital, I used to call up to my father and have a few throws with him and I got the feeling back for playing again. Can you remember your very first set of darts? My very first set of darts was bought in Lifestyle in Carlow. They were 16-gram brass barrels with red plastic flight/shaft combo. They were slim for a brass dart, but I used to throw ok with them. I still have them. Will you be competing in Q-School this year? Q-school is out for me this year as much as I am more ready for it this year than last year. I have qualified for the 6 Nations and World Cup for Ireland for the first time and it means everything to me to play for my country at a World Cup. If a PDC tour card was got in January, I wouldn’t be able to play in those events for my country. Which is your favourite darts venue to play in and why? I loved throwing in Wigan for Q-School and Bridlington for the World Masters. It brings your level of darts up so much since there’s so many good players around you, it’s a good atmosphere to be in. How do you prepare for the big competitions? Preparation for me can be different depending on how much darts is on in the week. Some weeks I could be throwing on a Tuesday, Friday, Saturday and Sunday. Other weeks could only be on Tuesday and nothing for a week. When there’s a lot of darts together I don’t practice much but if its coming up to a ranking event, most nights I’d get on the practice board for maybe two hours and work on finishing or do 101 double in just to keep loose around the board. How does it feel to be the Number 1 player in Ireland? Becoming the Irish number 1 meant everything to me. I had a goal in the year to make the World Cup team for Romania and that was in my head at every event. I have made a lot of friends in darts. Having spoken and taken advice from them on the game and giving me self-belief in my own game and what I can achieve. If you were to attend Q-School this year, would you be confident of winning a tour card? I would have felt confident that I was coming home with a tour card if I had to go this year. This year you will represent Ireland in the World Cup and Six Nations. This is an incredible achievement, how are you feeling about these big competitions? Making the Irish team for the Six Nations and World Cup is a great achievement and I’m getting to visit Holland and Romania as well. Getting to see other countries while doing something you love is great and hopefully, I can represent my country to the best that I can and do it proud. Which event are you most looking forward to this year? 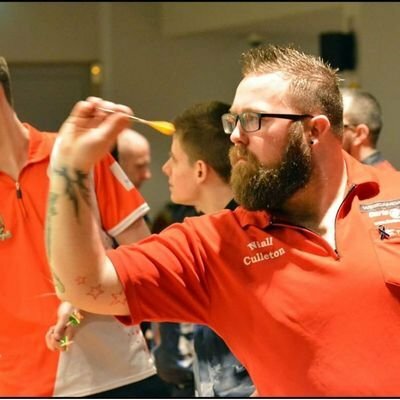 I’m looking forward to a lot this year as I’m entering a few BDO events through the year, but its got to be the World Cup. It’s what I’ve been working for the whole year and looking forward to it. I’ve had a few this year. Start of the year just missing out on a tour card, then I got to play in the UK Open qualifiers and since that’s an open draw, you have all the top professionals there trying to qualify as well. I was able to meet and talk to a lot of people I look up to in darts, it was a great experience. What darts equipment are you currently using? Currently I am sponsored by a great company called Cuesoul. They are a great company and have a lot of great products on the market. When the sponsorship was being finalised, they also said they would custom make my own darts, so I gave a few ideas of what I wanted in a dart and they blew me away with the dart they made me. I’m throwing so much better with these than my old pixel Mardle’s that I used which were great at the time. The dart is a 24-gram 50mm barrel and I use Cuesoul tero setup flights and shafts. Look up Cuesoul online to see the flight I use. They’re hard to explain but they have a spring in the shaft, so the flight retracts at the top to help deflections and they work great for me. Is there any particular practice game that you find beneficial? When at competition, I love doing finishing. It gets me focussed and dials me on and from that I know how I’m throwing. Who was your darting idol growing up? The legend that is Phil Taylor. He is the reason I stack my dart and use slim flights. I wanted to replicate him and for a time, I used to grip the dart exactly the same as him. I just loved the way he played the game and was in awe of what he could do on the dart board.